Reed canary grass is a large, coarse grass that reaches 2 to 9 feet in height. It has an erect, hairless stem with gradually tapering leaf blades 3 1/2 to 10 inches long and 1/4 to 3/4 inch in width. Blades are flat and have a rough texture on both surfaces. The lead ligule is membranous and long. The compact panicles are erect or slightly spreading (depending on the plant's reproductive stage), and range from 3 to 16 inches long with branches 2 to 12 inches in length. Single flowers occur in dense clusters in May to mid-June. They are green to purple at first and change to beige over time. This grass is one of the first to sprout in spring, and forms a thick rhizome system that dominates the subsurface soil. Seeds are shiny brown in color. Both Eurasian and native ecotypes of reed canary grass are thought to exist in the U.S. The Eurasian variety is considered more aggressive, but no reliable method exists to tell the ecotypes apart. It is believed that the vast majority of our reed canary grass is derived from the Eurasian ecotype. Agricultural cultivars of the grass are widely planted. Reed canary grass also resembles non-native orchard grass (Dactylis glomerata), but can be distinguished by its wider blades, narrower, more pointed inflorescence, and the lack of hairs on glumes and lemmas (the spikelet scales). Additionally, bluejoint grass (Calamagrostis canadensis) may be mistaken for reed canary in areas where orchard grass is rare, especially in the spring. The highly transparent ligule on reed canary grass is helpful in distinguishing it from the others. Ensure positive identification before attempting control. Reed canary grass is a cool-season, sod-forming, perennial wetland grass native to temperate regions of Europe, Asia, and North America. The Eurasian ecotype has been selected for its vigor and has been planted throughout the U.S. since the 1800's for forage and erosion control. It has become naturalized in much of the northern half of the U.S., and is still being planted on steep slopes and banks of ponds and created wetlands. Reed canary grass can grow on dry soils in upland habitats and in the partial shade of oak woodlands, but does best on fertile, moist organic soils in full sun. This species can invade most types of wetlands, including marshes, wet prairies, sedge meadows, fens, stream banks, and seasonally wet areas; it also grows in disturbed areas such as bergs and spoil piles. Reed canary grass reproduces by seed or creeping rhizomes. It spreads aggressively. The plant produces leaves and flower stalks for 5 to 7 weeks after germination in early spring, then spreads laterally. Growth peaks in mid-June and declines in mid-August. A second growth spurt occurs in the fall. The shoots collapse in mid to late summer, forming a dense, impenetrable mat of stems and leaves. The seeds ripen in late June and shatter when ripe. Seeds may be dispersed from one wetland to another by waterways, animals, humans, or machines. This species prefers disturbed areas, but can easily move into native wetlands. Reed canary grass can invade a disturbed wetland in less than twelve years. Invasion is associated with disturbances including ditching of wetlands, stream channelization, deforestation of swamp forests, sedimentation, and intentional planting. The difficulty of selective control makes reed canary grass invasion of particular concern. Over time, it forms large, monotypic stands that harbor few other plant species and are subsequently of little use to wildlife. Once established, reed canary grass dominates an area by building up a tremendous seed bank that can eventually erupt, germinate, and recolonize treated sites. Reed canary grass is difficult to eradicate; no single control method is universally applicable. In natural communities, mechanical control practices are recommended. In buffer areas and in severely disturbed sites, chemical and mechanical controls may be used. If herbicide is used, care should be taken to prevent contact with non-target species. Any control technique to reduce or eliminate reed canary grass should be followed by planting native species adapted to the site. Small, discrete patches may be covered by black plastic for at least one growing season; the bare spot can then be reseeded with native species. This method is not always effective and must be monitored because rhizomes can spread beyond the edge of the plastic. Prescribed burns in late spring or late fall may help reduce the reed canary grass population if repeated annually for 5 to 6 years. However, these fires are difficult to conduct due to water levels and/or the greenness of the grass at the time of burning. The application of 1.5% active ingredient solution of glyphosate will "brown off" reed canary grass enough to conduct prescribed burns. Burning is also ineffective in dense stands of reed canary grass that lack competition from native, fire-adapted species in the seed bank. A late-spring burn followed by mowing or wick-applying glyphosate to the emerging flowering shoots will eliminate reed canary grass seed production for that year. Mowing twice yearly (early to mid-June and again in early October) may help control reed canary grass by removing seed heads before the seed matures and exposing the ground to light, which promotes the growth of native wetland species. Discing the soil in combination with a mowing or burning regime may help by opening the soil to other species. Hand-pulling or digging may work on small stands in the early stages of invasion. Grazing can enhance diversity, although it will not control reed canary grass. A bulldozer can be used to remove reed canary grass and rhizomes (12-18" deep), after which native species should be seeded. Discing or plowing can also be employed in this manner. In small areas with few natives, another method involves repeated cultivation for one full growing season followed by dormant seeding near the first-frost date. Disrupting the plant roots every two to three weeks weakens the remaining plants and depletes the seed bank. When combined with spot herbicide application in sections too wet for early or late cultivation, results after two years have been good. Frequent and continued cultivation is important since one or two cultivations would simply cut the roots up and increase the number of individual plants. Small, scattered clones (2 feet in diameter) can be controlled by tying the stems together just before flowering, cutting them, and applying glyphosate in a 33% active ingredient (a.i.) solution to cut stems. A formulation of glyphosate designed for use in wetlands will kill reed canary grass (especially young plants) when applied to foliage. Apply in early spring when most native plant species are dormant. Any herbicide application should be done only after removing dead leaves from the previous year in order to maximize growing shoot exposure and to minimize herbicide use. A 5% a.i. solution of glyphosate formulated for use over water applied as a foliar spray will kill reed canary grass. Two herbicidal applications may be necessary to ensure complete coverage. Herbicide applied with a wick applicator attached to a tractor affects taller stands of reed canary grass without impacting the shorter vegetation. A late mowing in mid-September, followed by the application of 5% glyphosate a.i. 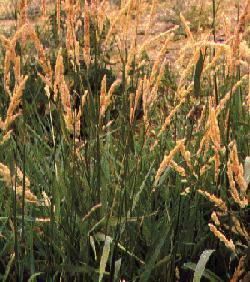 in October (after big bluestem is dormant) can help to control reed canary grass. Because reed canary grass productivity is reduced by shade, planting native shrubs or wetland trees in areas of chemically-treated grass may be effective. While herbicide kills reed canary grass, the seed bank may germinate and recolonize the site. Several herbicidal application may be necessary to inhibit seed bank recolonization. After the first application of herbicide has killed living plants, disturbance of the soil can encourage seed bank germination. When this occurs, the site can again be treated with herbicide to deplete the seed bank. An alternative method involves wick application of glyphosate in the first to third weeks of June, followed by a late June to mid-July burn. This technique reduces reed canary grass cover, depletes the seed bank, and stimulates native seed banks. In non-aquatic environments, DalponTM and Trichloracetic (TCA)TM effectively treat reed canary grass when applied in late fall or early winter. Both are soil sterilizing herbicides that must be sprayed on dried foliage in a rate of 20 to 40 lbs. per acre. Aquatic systems may also be treated with DalponTM for control up to two years. DalponTM is weakly cationic and is not absorbed by substrates the way most herbicides are.